In large bowl, beat cake mix, apple cider, 1/2 cup melted butter, the eggs, 2 teaspoons cinnamon and the nutmeg with electric mixer on medium speed 2 minutes, scraping bowl occasionally. Stir in apples. Pour into pan. Bake 35 to 40 minutes or until toothpick inserted in center comes out clean. Remove from oven. Let stand 20 minutes; run metal spatula around outer and inside edges of pan to loosen cake. Remove from pan to cooling rack; place cooling rack over waxed paper. Brush top and sides of cake with 3 tablespoons melted butter. In small bowl, mix sugar and 1 teaspoon cinnamon until blended. 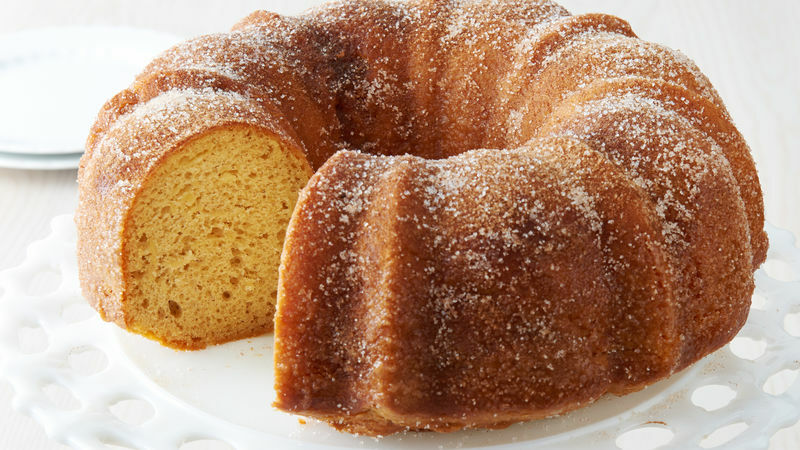 Press 2 tablespoons cinnamon mixture up side and top of cake with hand. Let stand 20 minutes. Repeat with remaining cinnamon mixture. Cool completely, about 1 hour. Granny Smith apples were used in this recipe—choose your favorite baking apple, such as Braeburn, Honeycrisp or McIntosh.